I’ve been enjoying a welcome break from the computer over the last couple of months as we’ve been ‘on tour’ in Spain. My aim was to get to a few of the places that I’ve never seen during my years in the country as well as revisiting many old favourites. Strangely there are quite a few places that I’ve been to on various occasions but I don’t have any good photos of them because I was there in the pre-digital age and scanning a load of old photos for the website isn’t a lot of fun. Far more enjoyable going there again with my new Nikon! So now I’ve accumulated a load of fresh information and new photos which I’ll be adding to the site over the coming months which I’m looking forward to sharing with you. After a night in Portsmouth’s Travelodge hotel we boarded the afternoon Brittany Ferries service bound for Santander on a cloudy Friday afternoon. So many times in the past we’ve driven down from Calais to Spain but this time we weighed up the extra costs of petrol, road tolls and overnight accommodation together with the additional ‘cost’ of having to sit at the wheel for so many hours (Calais to Santander is 1300km). The 24 hour cruise from Portsmouth to Santander on the modern Cap Finistère ferry was a real treat. We enjoyed a calm crossing and had a good sleep on board arriving refreshed in Santander on the Saturday afternoon at around 5.30pm. The blue skies of Spain that we were looking forward to were nowhere to be seen as we drove out of the port area heading for Burgos. In fact the cloud was getting heavier as we headed inland and any hopes of camping that night seemed to be disappearing. Then all of a sudden as we reached 1002 metres on the A67 at El Puerto de Pozazal the sky ahead of us as we looked from Cantabria towards Castilla y León was perfectly clear. We pulled in at the first service station to clean some salt from the car windows as it had been parked on an outside deck on the ferry and was completely coated in sea salt. We arrived in the mid-evening at the excellent Fuentes Blancas campsite with just enough time to get our fill of tapas and cold beer at the camp restaurant. On the Sunday lunchtime we enjoyed a wander around the many tapas bars of Burgos in the company of various ‘peñas’ who were celebrating a local fiesta each with their own lively band. As always a stop in Burgos wouldn’t have felt complete without yet another visit to its amazing Cathedral. Two of the Spanish cities which remained on my ‘to do’ list were Palencia (Castilla y León) and Plasencia (Extremadura). On leaving Burgos we headed south-west stopping off in Palencia to take a look at its Gothic Cathedral before heading on to Valladolid, Salamanca and Plasencia. Rather than stay in this small city we headed into Monfragüe National Park staying at Camping Monfragüe which turned out to be one of the main highlights of the summer (I’ll soon be writing an extended post about the park). The park is absolutely stunning with amazing geography and birdlife. We did some walks from the ancient village of Villarreal de San Carlos which is central to the local tourism industry and took a fantastic half day birdwatching excursion with Alberto Rubio from En-Ruta. Alberto was so knowledgeable about the region and knew all the best spots to see the birdlife making this one of the best trips I’ve ever done on my many travels. Away from the park we visited the old city of Plasencia and took a day trip to Jarandilla de la Vera (its Parador is fabulous) and the monastery at Yuste where Holy Roman Emperor Charles V spent his final years. Next year Kirsty and I are going to Peru so we were very keen to pay a visit to the birthplace of the Conquistador Francisco Pizarro who is famous for conquering Peru. He is buried in Lima Cathedral. It’s incredible how many Conquistadors came from Extremadura travelling from this barren land to play their part in discovering the Americas on behalf of the Spanish Empire. Some of the more famous names include Hernán Cortés and Vasco Núñez de Balboa. In fact, Santiago (the capital of Chile) was originally named ‘Santiago de Nueva Extremadura’. An interesting anecdote here. Apparently the statue of Pizarro that you see above was originally created as Hernán Cortés with the intention of presenting it to Mexico. Not surprisingly the Mexicans aren’t all that keen on Cortés’s “achievements” and they refused to accept the statue. It was, therefore, presented to the city of Trujillo as Pizarro! There are many places in the world where you wouldn’t be too upset at the failure of the air-conditioning in your car, Extremadura isn’t one of them! With no air-con we continued on our tour of the region with stops in Cáceres (thanks Liz for recommending Camping Cáceres) and Mérida where the Roman ruins just seem to get more impressive with every visit. After a visit to Zafra, where the Parador is highly recommended if you’re travelling through the region, we entered Andalucía. Staying at Camping Villsom in Dos Hermanas we had a couple of days sightseeing in Seville before heading down to Jerez de la Frontera and Conil de la Frontera on the Cadiz coast. As we were approaching the coast there was a noticeable increase in the wind and by the time we arrived in Conil it was blowing like crazy. We had a very nice paella at one of the seafood restaurants at Playa de La Fontanilla then spoke to one of the lifeguards who explained that the Levante winds had just arrived and were likely to continue for at least four or five more days. This made camping impossible so we decided to cut our losses and head back inland. After a brief stop in Vejer de la Frontera we followed ‘La Ruta del Toro’ through Medina Sidonia to Arcos de la Frontera. This is the region of Andalucía where you’re most likely to see the enormous farms where Spain’s fighting bulls are bred. Now away from the oppressive winds of the coast we spent a few days touring ‘Los Pueblos Blancos’ before arriving in the beautiful town of Ronda which not surprisingly always seems to find its way onto my tours of Spain. The El Sur campsite is a favourite of mine thanks to its great swimming pool and the terrace of its restaurant which is such a great spot for an evening meal or just a quiet drink as the sun goes down. There always seems to be something special about the colour of the sky in Ronda, it’s such an incredible blue. When I first set up Spanish Fiestas I used a photo of the sky there as the main part of the website’s colour scheme! Having lived on the coast of Granada for a number of years I’ve often felt a little guilty at how little time I’ve spent in the Alpujarras mountains so the campsite at Órgiva seemed a logical next stop. From this base we took a full day excursion out to the best known of the Alpujarran villages, namely, Pampaneira, Bubión and Capileira. What beautiful villages where a nice balance has been struck between the continuity of traditional village life and the growth of rural tourism. I could get used to this life! There are plenty foreign residents in the area as well as tourists yet the villages manage to retain their traditional character. On another day we took a drive to Trevélez in the high Alpujarras (1486m) via the A346 followed by the A4130 and A4132. I mention the road numbers because it really is one of the great drives of Andalucía though not for the faint hearted as the climb to the village and the tight bends really are something! The village itself is famous for curing some of Spain’s finest hams. We wandered into the ‘Secadero Al-Andalus’ and asked the gentleman at the desk if we could see one of the curing floors. He was so obliging and showed us around, explaining the whole process of ham curing and what a sight to see literally thousands of hams hanging from the ceilings of these rooms. It’s a few years since we last revised the Costa Blanca section of Spanish Fiestas so we decided to head for another old favourite at Camping El Naranjal in Jávea which again proved a great base from which to revisit some of the main resorts of the region. Some of the best beaches in Spain can be found along this stretch of coastline as well as a variety of resorts ranging from the essentially British flavour of Benidorm to the almost exclusively Spanish resort of Gandia. There are some nice inland excursions to the likes of Xàtiva and Guadalest but the majority of tourists were there for the sun and beach, and who can blame them after the appalling winter endured by visitors from northern Europe. As much as I enjoy visiting this coast I felt that we were very much on a tour of the ‘real Spain’ as many guidebooks call it so I was itching to get back on the road after our Costa Blanca visit. Next stop was the city of Valencia which really is impressive these days with its City of Arts and Sciences a real highlight. From Valencia we went inland to Teruel and Calatayud passing through some remarkable Aragonese villages in what seemed like a land that time forgot. Beyond Soria we headed for Camping Cobijo on the outskirts of the charming village of Vinuesa in the Picos de Urbión. Shortly after putting up the tent we were hit by violent thunderstorm with torrential rain completely flooding us. We had little alternative other than to abandon the tent and head into the village of Vinuesa where we stayed in the lovely Hostal Revinuesa. This gave us the chance to enjoy some nice meals in the lovely old town at Plan B Vinuesa where we were welcomed as locals on our first visit. Whilst the whole area is a true hidden gem the highlight is a visit to the glacial lake called La Laguna Negra. There are loads of opportunities for hiking in these mountains with El Pico Urbión reaching 2,229 metres. La Cima de Tres Provincias is notable as it’s the point at which the provinces of La Rioja, Soria and Burgos meet. Far too strenuous for me I’m afraid so it was time to again hit the road. We left Vinuesa via a narrow mountain road that took us through Montenegro de Cameros and we were rewarded with some stunning scenery not least the incredible rock formations around Torrecilla en Cameros on the N111 approaching Logroño. Having tried more than a few glasses of Rioja in the tapas bars of Haro and Cenicero (in the name of research of course!) we paid a visit to Vitoria, the capital of the Basque Country before heading into San Sebastian at the end of our two month tour. I never tire of these trips around Spain, in fact I think the more I travel the more I want to travel. This particular tour has now given me the idea to get a campervan one of these days and head for more of the ‘off the beaten track’ locations around Spain as well as timing visits to coincide with local fiestas. Although I reckon I’ve seen as much of Spain as just about anyone out there this trip opened my eyes to just how much is still out there. The time spent around Monfragüe, the Alpujarras and the Sierra de Urbión were real highlights of the summer yet I’m astounded at how many signs we passed for a ‘Parque Natural’ that I’ve never even heard of. No worries there, just lots more areas of natural beauty just waiting to be discovered. Obviously this is a condensed description of our tour, over the coming months I’ll be sending out more information to our newsletter subscribers. If you’ve enjoyed your own tours of Spain we’d love to hear from you. Please feel free to add your comments below. Our readers always love to share tips on their travels in Spain. I love Spain, great pictures of all the lovely places and the bridge in Ronda brings back sweet memories. It must have been a great experience, thank you Gerry. Hello there have just looked at your photos . they look great,,,,, its going to be as close as I will ever get to see spain now as I am partly disabled, I have osteoarthritis in my spine and I cannot walk far…. Your trip sounded incredible, and the photos are amazing, this is something I would love to do if I had someone to travel with. When you were in Valencia you should have visited Cuenca it is a beautiful small village, my friend is from there. Looking forward to more of your travels. Hi Marian … We didn’t have a fixed plan for this trip and were constantly changing our thoughts on where to head for. Cuenca was considered but we ran out of time. Been there before but not with a digital camera so will have to schedule it in next time. Reading your commentary and the photos of the various places just open up my appetite to pack up and travel again. Unfortunately there are some restraints just now. The sites that you covered are interesting and the photos just crown it all. Spain has its beauty and culture with buildings and sceneries which are so placid and captivating. Those who have not visited Spain should vow it to themselves a must-see country in their travelling agenda. Excellent photos. We did the Portsmouth Santander ferry last September. Stayed in Travelodge at Cribbs Causeway, Bristol on the Saturday night and ferry on Sunday. Stayed about halfway to La Duquesa, in Las Glorias. Had a great time. Glad you are back. My wife and I will be in Spain for 3 weeks in September. We will be making our first trip to Tarifa do you have any ideas as what to do for 3 or 4 days. Enjoyed the different photos very much. Thanks again for your e mail updates. 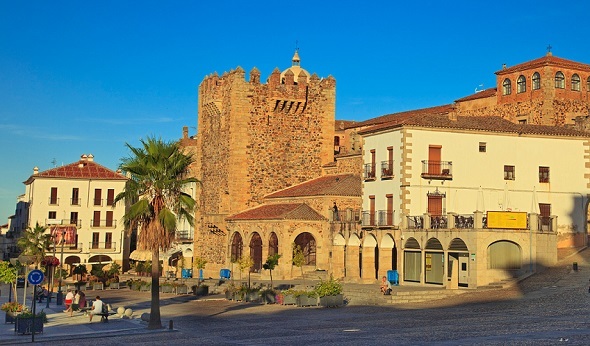 Last summer I hired a car and did a similar circuit around Extremadura — to Trujillo (loved it! ), Monfragüe (amazing! ), Caceres (so many layers of history! ), and down through Zafra to Sevilla. Fortunately my car had air conditioning, which I’d recommend as a basic necessity if you’re heading that way in July or August. When I was there, temperatures reached 40*C in Caceres … even the locals agreed it was a bit extreme! It certainly gets hot down that way. Was not impressed with my a/c having had it fixed (theoretically) before the trip. Leaving places at first light still didn’t make up for lack of a/c as it gets hot so early in the day. Thank you for the article. I was stationed in Rota with the US Navy from 80-85. Traveled through the “Los Pueblos de Blanco” and we would camp on the hills in Costa de Mecca and walk down to the beach. Life was good in southern Spain! After disembarking from the Brittany Ferry in Santander, a route worth taking is along the coast and the to The Peaks of Europe National Park. I was born in the town of Potes, Liebana, Cantabria. Worth the time to visit and before taking the road up to the mountains, the fishing village of San Vicente de la Barquera is a good place for a meal of fresh seafood. I enjoyed your fotos. Thanks Manolo … I love San Vicente de la Barquera. Thought about going there at the start of this trip but there was a fair amount of rain around so we headed inland. Thank you for sharing. Your site always brings back so many memories. I really fancy an extended tour by campervan so that there’s no need to fear bad weather. But it does concern me that we’d miss out on some of the more remote areas. No doubt we’ll give a try one day. Hi Gerry,wonderful description but I am confused as you say that you left from Portsmouth. Thought that you lived in Spain. I’ve been in Spain for more than 20 years but have been spending some time in the UK over the past few years. Was delighted to escape the heavy summer (!) skies in the UK and get back “home” to Spain. Best and worse time of year to go on a trip in Spain? Some terrific photos and one liners to go with your tour. Some very nice publications with stunning views. You must have enjoyed the experience even though you’re a seasoned traveler. As I write this it’s chucking it down with rain here in Aberdeen, (What’s new eh!) and you have now put the though of a holiday to Spain in my head. Hi Gerry, did you like Xativa? I love feel of that place, lovely relaxed evenings walking around with the castle up high above, lots of great places to stop + eat. The arranged trip by tourist info by train is a good start up to the castle, then you have your bearings of all that history to explore …. Hi Jayne … Lovely place to visit with a great atmosphere. Your trip sounds wonderful. Thanks for sharing it. I think it’s much better when your plans are flexible and you can go off and see something that catches your eye. Have you ever been to the north west corner of Spain, Galicia? We flew over it returning from Portugal and it looked stunning. I have heard it can rain quite a bit though. Thanks Lynne … Vejer really is a special place. Great post. There is just so much to see and do in Spain. So much history, so many fabulous towns and it’s huge natural protected areas to. Just have to keep on exploring. Hi Gerry, what a trip you had. I hope my wife and I can do something similar in the future. Your emails and website continue to be a source of avid reading and I gain both inspiration and knowledge. Many thanks. Thanks for your kind words Barry … much appreciated. Just returned from trip to Extramadura thanks to your reccomendations on both places and car hire,which were excellent. Flew to Madrid, 2days there, picked up hire car and off we went. Ist problem was getting out of Madrid (The land of no signs) Connection in car for Sat Nav not working. 2 nights in Camping Monfrague..trip with En Ruta,excellent guide, Valentin, saw several kinds of vultures and also the rare black stork. Excellent value trip. On to Merida, amazingly preserved Roman “Ruins”. Then to Badajoz, disappointed in battle history but frightening height of walls to assault. Next was Caceres, fantastic place (Spain lost to Holland) Free concert by orchestra in square fabulous. On to Trujillo, (lovely town) fab.food and saved a lot of wine going bad. People so friendly and helpful. On then to Talavera, Found the memorial to Regiments who fought there in the Peninsular War. Shame it was not better looked after. Interesting tapas places and more vino. Tapas more like a full meal. Then a nightmare driving back to Madrid airport, Signs once again missing, Helpful van driver led us eventually to airport. Overall the second week was unseasonably hot (in the 40’s) and couldn’t really venture out in the afternoon. Stayed in some wonderful hotels in 19th century buildings, mainly only met Spanish tourists, ate some great food and drank some even better wine. Will certainly return but will make sure we can use the satnav. as Extremadura is not noted for its signage!! Thanks for pointing us in this direction Gerry. Thanks Robin. I’m delighted that you had such a great trip and that I was able to help you plan it. Such feedback is so welcome. Thanks for sharing your trip … fantasic … I would love to follow your trail … I think a camper van is on the cards very shortly.